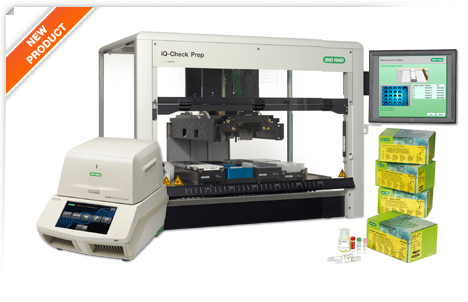 The iQ-Check™ Prep is a liquid handling platform performing DNA extraction and PCR plate set-up. Designed for use with the full range of iQ-Check food pathogen detection kits and the CFX96 Deep Well™ real-time PCR system, it provides a completely integrated automated solution for food pathogen testing. Optimal ease of use and full traceability is achieved by the link between the CFX Manager™ IDE Software and a laboratory information management system (LIMS). The iQ-Check Prep Solution provides increased confidence in results, high reproducibility and robustness to routine testing labs. It fits seamlessly in laboratory workflow without disrupting it and is an ideal solution for medium to high throughput testing laboratories. AOAC and Health Canada extension pending.